Wow! That looks awesome! Thanks for being such intrepid scouts. I love that I can go to either blog and find unusual recommendations. Tried it out after you texted me, and am smitten with this new truck. 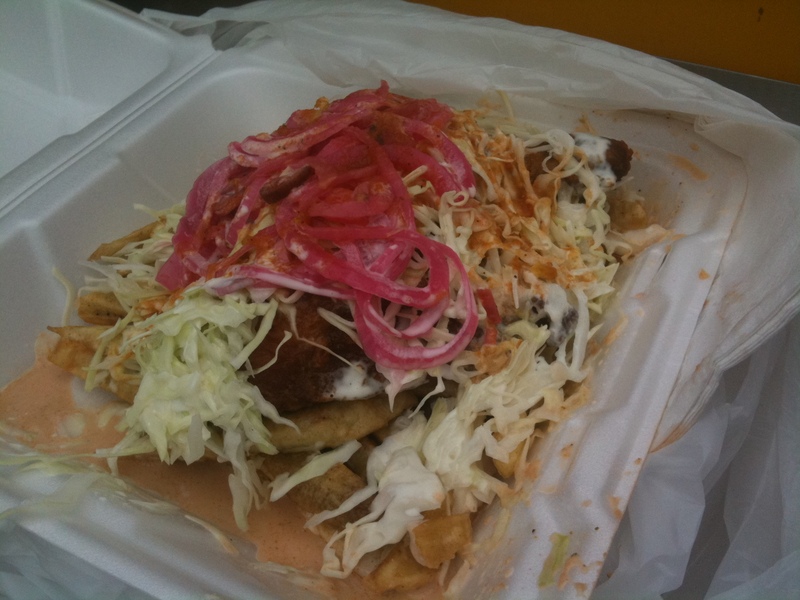 Dunno what is in that sauce on the onion/slaw, but it’s downright addictive. We loved every single thing we tried. Thanks for the heads up! Thanks so much for all the work you do. 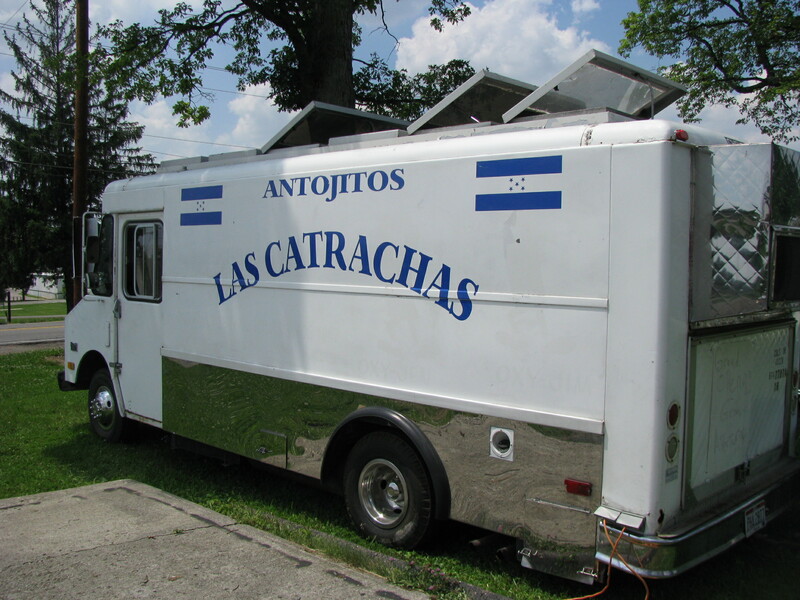 If it wasn’t for this blog I don’t think I would have ever heard of Las Catrachas. Sarah – they mentioned that they might be open today since it’s a holiday. Might want to give ’em a call. That looks great! Can’t wait to try it! Thanks for the great work you’re doing here! We just had lunch @ Las Catarachas. 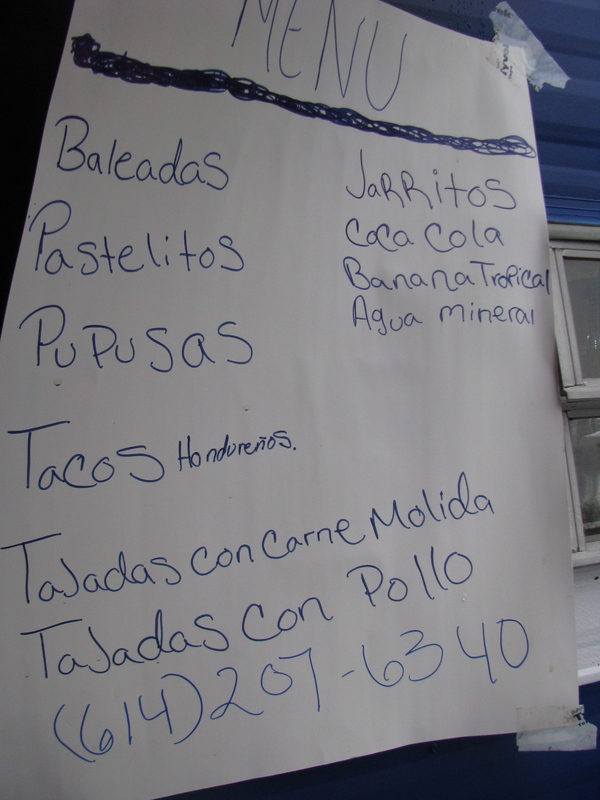 The food was wonderful – especially the tajadas de guineo verde con pollo. Wow! Even with our very limited Spanish the communication was no problem. Go try this place soon! I tried it out last night and absolutely loved it. I had the Tajadas de plantan con pollo (or something like that). 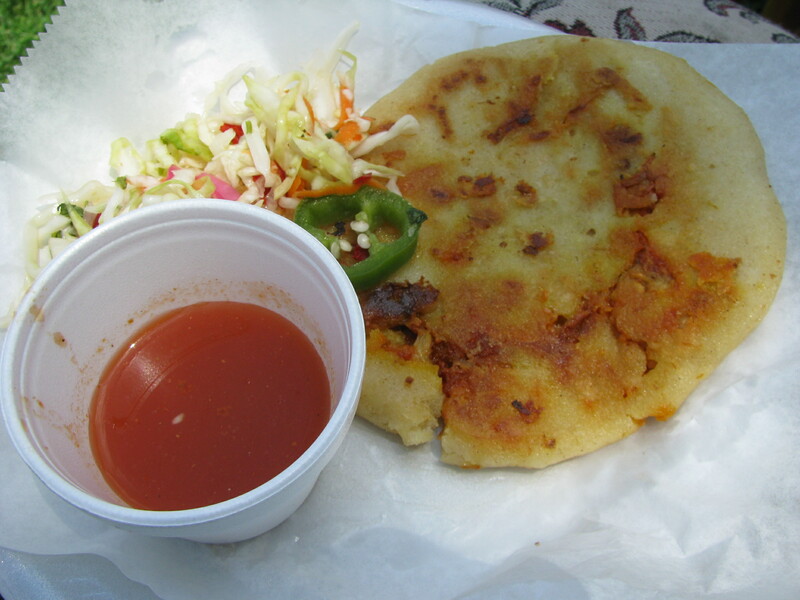 I also tried a Pupusa. I would recommend getting the green sauce. It is hot but adds flavor to whatever you eat. I am glad it is not too far from me. I was a little surprised at the price but glad that English with limited Spanish works fine. Glad you enjoyed it. 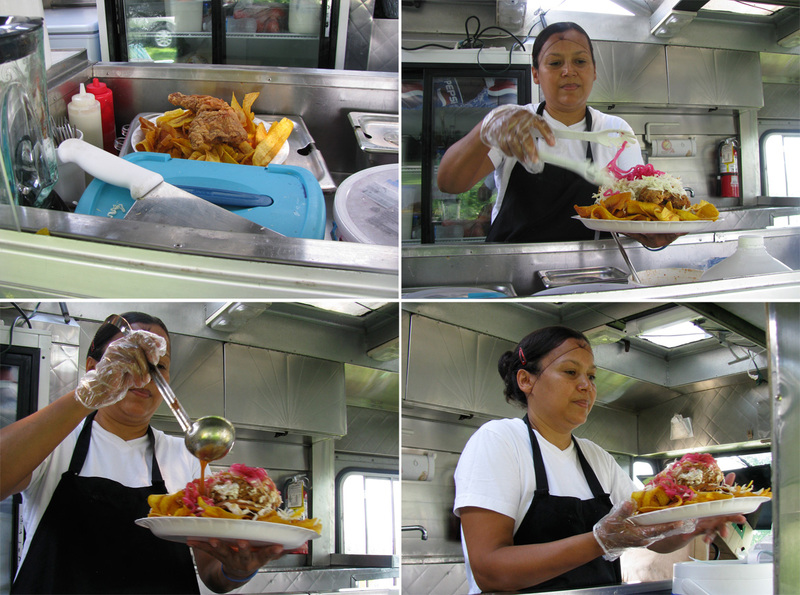 Can’t say I felt there was anything unusual about the pricing – most of the trucks that carry full plate meals price them around $8-$10. 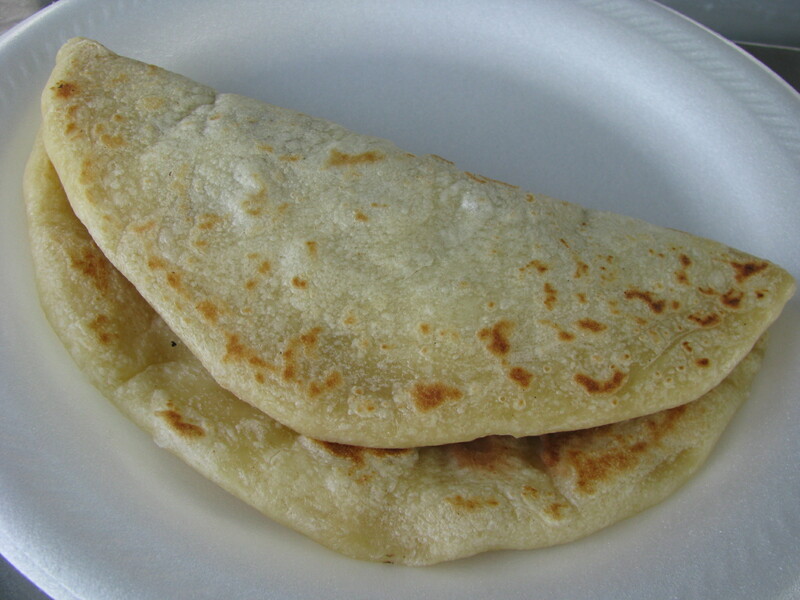 IIRC, the pupusas were $1.50-$2.00, which is fairly typical. Just had lunch from here. The fried chicken is extraordinary. Thanks for getting me to drive ten minutes to this place! Tried this place on Saturday. Amazing! 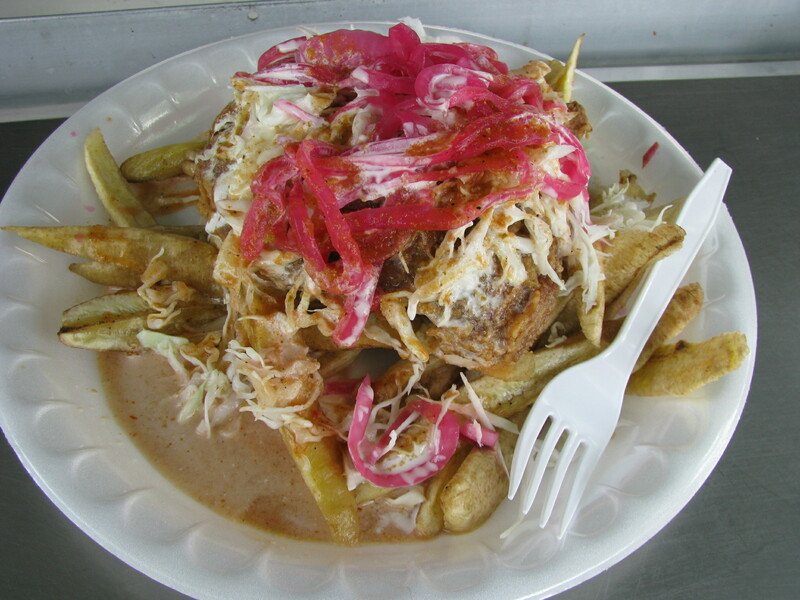 The fried chicken was among the best I have ever tasted and my girlfriend freaked out because the pupusa was the closest thing she has found to a food she used to eat all the time off the street vendors when she lived in Mexico (without the red pill to stop violent illness). This has become our new favorite cart. Tried this place for the first time tonight. Ordered the tajadas de platanos verde con pollo and am now happy and stuffed. As promised, GREAT fried chicken and the mix of crispy plantains, chicken, slaw, onions and sauce is difficult to exactly describe but tasted great. Totally worth driving out there in a rainstorm. Cuts down on the line! (Although I wasn’t the only crazy one out there looking for dinner!) Thanks for the suggestion. I’ll definitely go back. 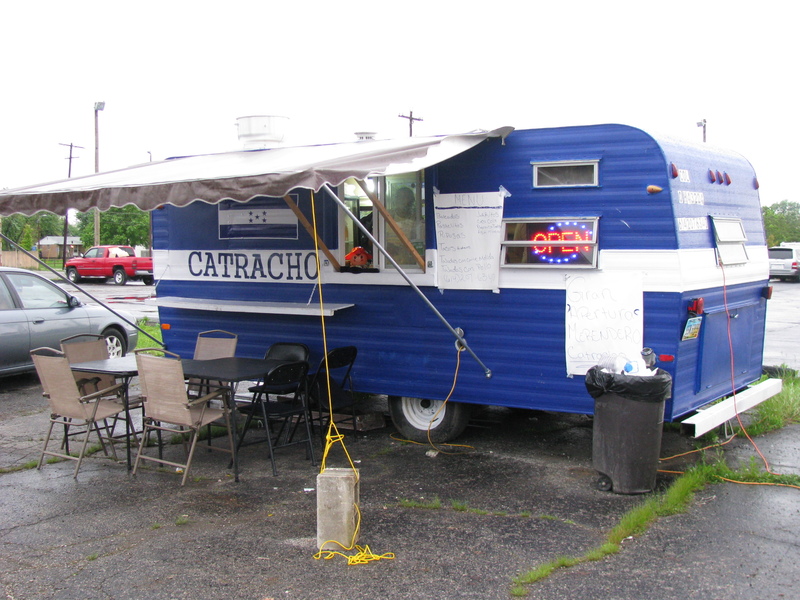 I heard this truck had moved … any updates on it’s new location/hours? They’re not open yet (that we’ve heard), but they’re supposed to open any day now. They should be in the same location as end of last year, across from Otro Rollo on Sullivant. YES!!! I was so hoping these folks would manage to reincarnate themselves. What good news! Any updates on this truck? 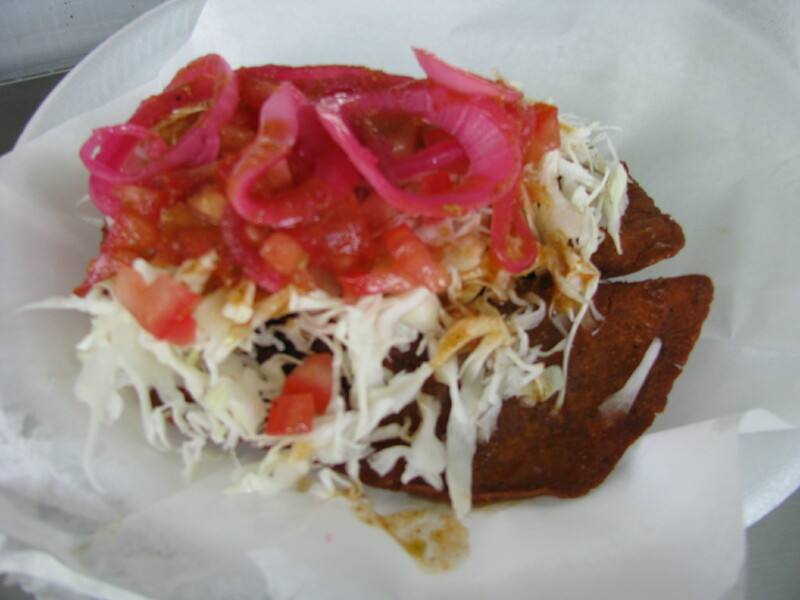 I have driven past their most recent spot a few times over the last year with no luck … I could really use a baleada! Great news! Are they at the same location? As of October 22 2016, this truck is no longer in the area. Nearby bakery advised the operators were deported.